Mahmoud Ahmadinejad is meeting with survivors and bereaved families of the 9-11 attacks, journalists and critics of the Bush administration (Pelosi???) while in New York City! TEHRAN (Fars News Agency)- Iranian President Mahmoud Ahmadinejad is due to attend a meeting in New York this week with the critics of the US administration’s hawkish policies. The meeting will take place during Ahmadinejad’s visit to New York to attend the annual meeting of the United Nations General Assembly. During the two-day visit, the Iranian president, who will be accompanied by a group of high-ranking officials, is scheduled to conduct a speech at the general assembly meeting, attend bilateral talks with several of his counterparts and meet Iranians residing in the US. Delivering a speech at Colombia University, and holding discussions with a number of American Muslim, Jewish and Christian leaders are among the president’s programs during his visit to New York. The Iranian president will also have interviews with a number of leading US media. Meanwhile, he is to hold talks with Iranian expatriates residing in New York. Side note: Ahmadinejad is staying in the same hotel as the Toronto Blue Jays on Sunday night. 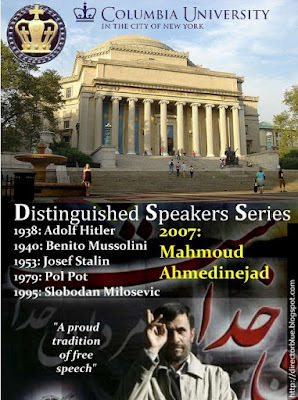 ** Serendip found out who is behind Ahmadinejad’s visit to Columbia University. UPDATE: Iran is protesting NYC officials for not allowing Mahmoud to visit Ground Zero.